You may or may not know this about me, but when I was younger, I thought I was going to be a Marine Biologist. I loved the ocean and everything about it. I read books, watched documentaries, and just studied as much as I could about the ocean and the creatures within. And true to any kid with a passion, my room looked like an underwater cavern with dolphins, whales, manatees and coral. I don't know exactly when my deep love started, but I think it may have stemmed from back in 1988 when "Shark Week" began. 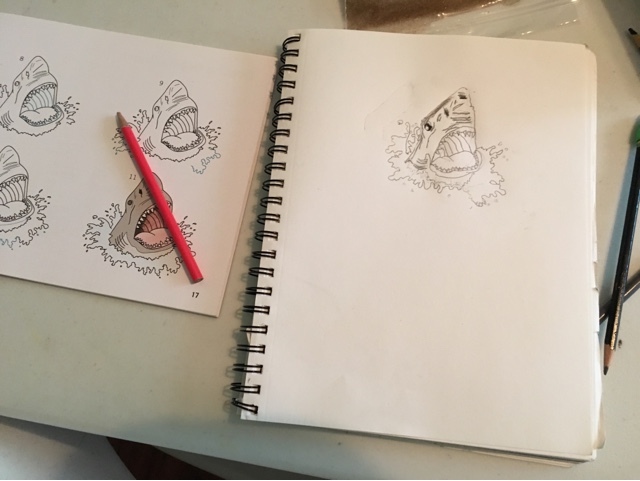 For my family, Shark Week was a wonderful tradition. We made special plans to be able to watch it every night. And we LOVED it! Every year it was an anticipated event. And if perhaps we were at the beach when it was on, it was just like God had given us special favor for a moment. Yeah, we were that excited about it! When I got married I found out that not every family made this week special in their lives. Ha. It was amusing for me to find out that the NFL draft was a big holiday in the life of my husbands family. I had no idea that late April had such a treasured date. I learned soon enough. It's no wonder with my great love of the ocean, that it passed along to my children. Since we don't have regular television, we make a short trek to my Mom's house each night. We sometimes pop popcorn. I drink coffee and we watch "Shark Week". 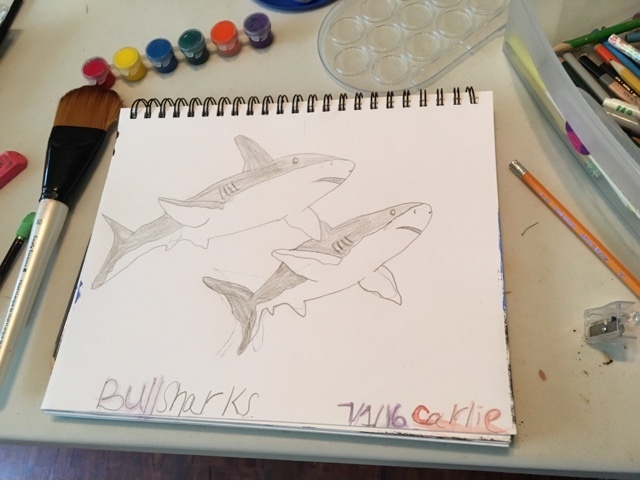 The kids have obviously learned a little from their old Mom and with just a little prompting, we decided to sit down and draw some sharks. 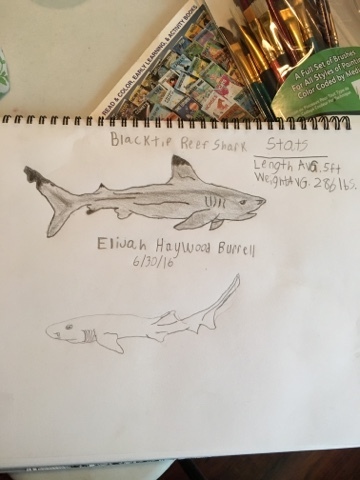 Eli asked to do a little online research of shark stats. We watched some episodes of "The Blue Planet" on Netflix. We also pulled out some of my old oceanography books and perused their pages searching for information! My kids art skills are pretty awesome if I do say so myself! And when Carlie's 12th!!! 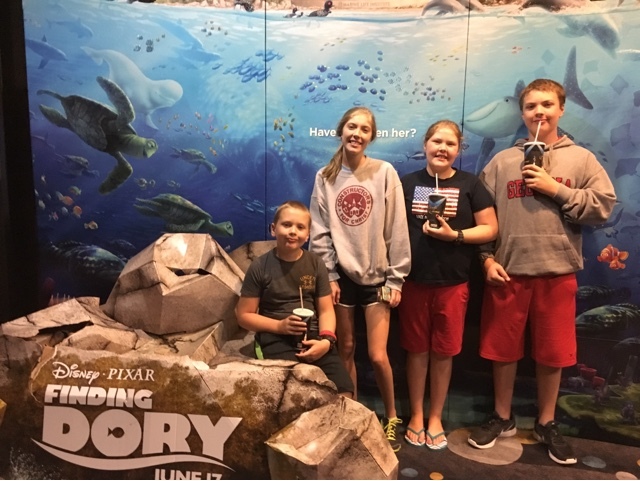 birthday rolled around yesterday, I couldn't help myself but to want to take them to see "Finding Dory". I was totally captivated the beautiful ocean scenery in this movie. All the ocean life looked real, it was a sweet, humorous movie and we all enjoyed the movie very much. Today, I am not a marine biologist. I don't live close to the sea. 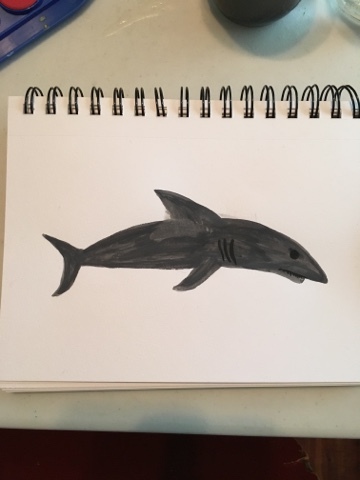 But I still have a deep love of the ocean, I enjoy learning about marine life and I do my best to pass along that love to my children through our learning and our life. Happy Birthday to Carlie! Love the drawings..my kids and grands can all draw good too. but not me. They got that skill from my hubby. I love the water and am only a few minutes from the Gulf of Mexico and spent so much growing up time at the beach. Have not been for a couple of years as I can't stand up to the waves anymore....hate that. But am determined to go before summer is over and sit on the water's edge while Paw-Paw and grandson Austin play in the waves. Blessings, Carolyn in Fl.